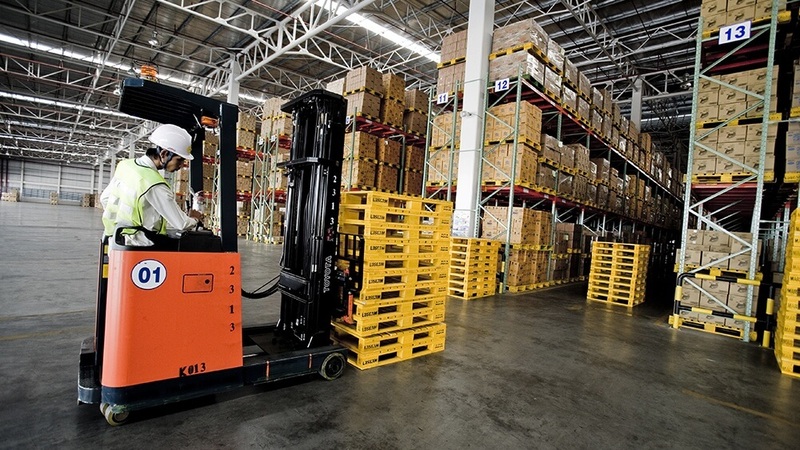 Optimizing and automating the pallet dimensioning process is an important factor when trying to increase efficiency for many logistics organizations. An effective way to automate this process is to adopt a pallet dimensioner. As this technology becomes mainstream it’s not surprising to see new vendors jumping into the market. On one hand this is great, because it helps lower the price of pallet dimensioning systems making it more affordable for small and mid-size companies – excellent opportunity. On the other hand, it also means a greater variety of systems with different capabilities and features – more confusion & risks. With that in mind, this article will help you navigate through the features, capabilities, and other considerations you must keep in mind when buying, leasing, or renting a dimensioning system. Not every dimensioner can measure every pallet/freight size. These systems have limitations as to the size of pallets they can effectively measure. The dimensioning capabilities of a system are given in inches and expressed in Length, Width & Height. Dimensioning capabilities of a system can range from minimum dimensions of 8 x 8 x 8 and maximum dimensions of up to 132 x 96 x 108. Before reviewing pallet dimensioning systems be sure to collect historical data of the pallet measurements processed by your business over a period of at least 6 months. Once you’ve collected a consistent range, add some additional room in case you start processing larger pallet sizes in the future – protect the investment. The ability of a system to accurately dimension a pallet depends on multiple factors. Among the most important includes the technology being used (laser, infrared, ultrasonic, 3D scanner – or a combination), the limitations inherited by each technology, and whether the technology being used is intended for commercial or consumer purposes. Laser is the most accurate technology, but also the most expensive. Commercial infrared sensors have come to be very accurate and also more cost-effective. 3D scanners are less accurate although the technology is progressing considerably. The accuracy of a pallet dimensioning system is measured in inches with a +/- margin of error. An acceptable margin of error ranges between ±0.25″ and ±0.50″. The scanning speed of a pallet dimensioner is another technical spec to keep in mind, especially in operations that process large numbers of pallets. The scanning speed of a dimensioning system is measured in seconds and is counted from the moment the scan is triggered to the moment the scan is completed and dimensions captured. The average scanning speed for these systems vary between 3 to 6 seconds. Although it’s normal to conclude that a faster system is better, remember to consider the technology being used and its accuracy. Very often there is a trade-off between dimensioning range, accuracy, scanning speed, & cost. Most pallet dimensioners can be implemented as a standalone solution and do not require integration with a WMS, TMS or ERP. Without integration, most systems provide a built-in interface and methods to trigger the scan and display the dimension information. But to truly maximize operational efficiency and reduce data entry errors the systems must be integrated with the WMS, TMS or ERP. Typically, these systems can be integrated via an Application Programing Interface (API), or XML files that can be published in an FPT site to later be picked & processed by the WMS, TMS or ERP system. Always check with your vendor for the integration options available and whether there are any costs associated with the integration. The NTEP certification from the National Conference of Weights and Measures (NCWM) provides assurance that weighing and measuring instruments are manufactured to meet commercial standards. NTEP certified equipment & instruments have been tested and evaluated to meet government standards and serve as a guideline to help end users invest in the right system. Equipment/instruments that are NTEP certified are labeled with the following logo. Why is this important? Because any business that charges or sells based on weight or size in the United States must use a Legal-for-Trade dimensioner or scale instrument. So if you have a dispute, you want to make sure that your pallet measurements are NTEP certified to prove accuracy. For the most part, the acquisition of a pallet dimensioning system requires a significant investment or contractual commitment, so it is important to select the right manufacturer to protect your investment. From a vendor perspective, you want to verify that the manufacturer has a history of research & development in this area. As this technology becomes mainstream, products will continue to evolve overnight. For a vendor that is not specialized in this market segment it will be almost impossible to keep up. From a warranty viewpoint, validate what is covered by the warranty (the entire system or specific components), the length of time the equipment and/or components will be covered, and who will be responsible for maintenance in the case of failure. Finally, confirm who is responsible for providing support and if there are any charges related to it. 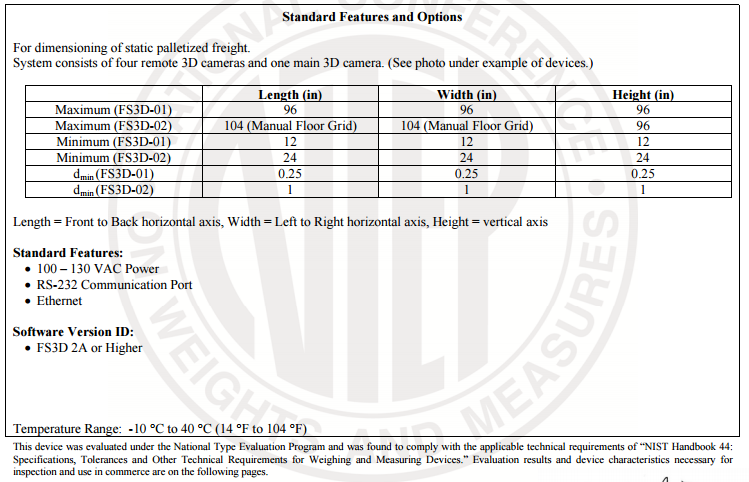 There are other features that your business could benefit from, like the ability to take pictures of the cargo or integrating the pallet dimensioner with the weighting scale. Check this and all the above considerations before committing to a product and manufacturer. Take your time and do not rush the decision. Remember, you are free to choose, but you are not free from the consequences of your choices.